269 There's next to nothing to be said for Marius because his reign was so short. The historian Eutropius writing about a hundred years after his death records his reign as lasting all of three days. Aurelius Victor, another historian contemporary to Eutropius, has him murdered the following day. This is of course hyperbole as evidenced in the fact that relatively many coins of him survive. The man was a blacksmith and how he made the jump from that lowly career to becoming an emperor, however short his tenure, should be worth its own "Movie of the Week" award. 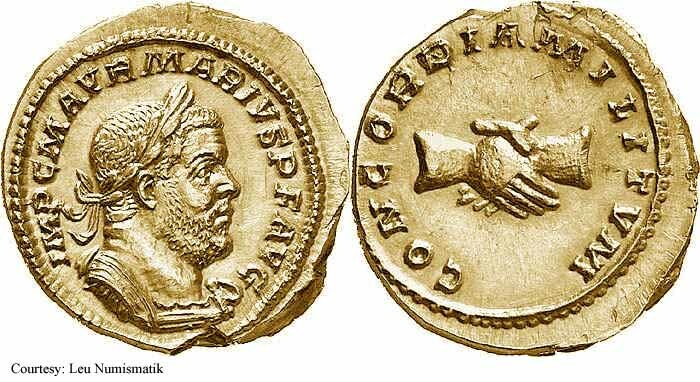 He succeeded Laelianus, another short-lived emperor, when the undisciplined troops under his command were told to hold their positions following an initially successful attack on barbarian-controlled Mainz. The soldiers wanted to recover war loot and wouldn't be held back by Laelianus so they murdered him and named the head rabble-rouser, Marius, as their next emperor. RIC 1, C 3 Aureus Obv: IMPCMAVRMARIVSPFAVG - Laureate, cuirassed bust right. Rev: CONCORDIAMILITVM - Hands, in handshake. June - August 269. $138,734 5/6/03. 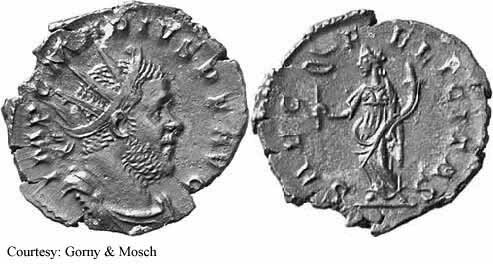 RIC 7, C 4 Antoninianus Obv: IMPCMARIVSPFAVG - Radiate, draped and cuirassed bust right. Rev: CONCORDIAMILITVM - Hands, in handshake. RIC 10, C 13 Antoninianus Obv: IMPCMARIVSPFAVG - Radiate, draped and cuirassed bust right. Rev: SAECFELICITAS - Felicitas standing left, holding caduceus and cornucopia. $156 3/5/02. 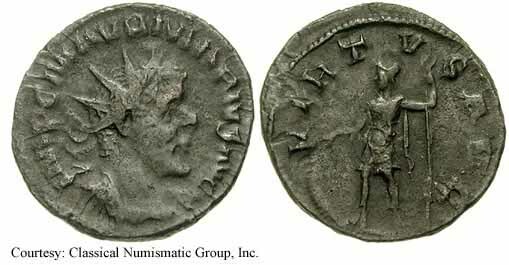 RIC 17, C 19 Antoninianus Obv: IMPCMAVRMARIVSAVG - Radiate, draped and cuirassed bust right. Rev: VICTORIAAVG - Victory standing left, holding wreath and palm. $218 1/3/04. 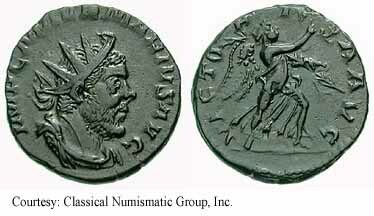 RIC 18 Antoninianus Obv: IMPCMAVRMARIVSAVG - Radiate, draped and cuirassed bust right. Rev: VICTORIAAVG - Victory advancing right, holding wreath and palm. $195 1/16/02. RIC 19, C 22 Antoninianus Obv: IMPCMAVRMARIVSAVG - Radiate, draped and cuirassed bust right. Rev: VIRTVSAVG - Mars standing left, resting resting hand on shield and holding spear. (Colonia Agrippinensis).